Rockies pitcher Juan Nicasio is Monday's Player of the Day, while Dodgers pitcher Zack Greinke rises to sixth in Box-Toppers player rankings. Nicasio pitched six shutout innings and struck out nine in the 6-1 win over the Giants. Greinke, who was top player in his game Monday, moves from 10th to sixth place in season player rankings in Box-Toppers points. Greinke (8.2IP 9K W in 6-2 win vs. Cubs) earns 1.0 Box-Toppers point, giving him 15.7 for the season. Chris Carter of the Astros is American League Player of the Day. Carter hit two home runs, drove in four runs and went 3-for-4 in the 10-8 win over the White Sox. Allen Craig of the Cardinals is National League Batter of the Day. Craig hit a grand slam and went 3-for-4 in the 8-6 win over the Reds. Notable: Phillies pitcher Cliff Lee rises to 30th place in Box-Toppers player rankings after earning Player of the Game honors Monday. Lee (8IP 1R 7K W in 2-1 win vs. Mets) picks up 1.0 Box-Toppers point, giving him 10.4 for the season. 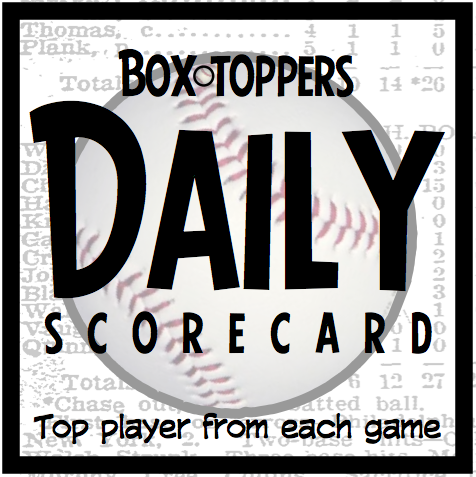 Nicasio receives 2.0 Box-Toppers points for being Player of the Day. Carter receives 1.7 for AL Player of the Day. Craig receives 1.5 for being NL Batter of the Day. All of Monday's other Players of the Game (listed in the chart below) receive 1.0 Box-Toppers point. ` Denotes that the pitcher had a no-decision in the game and did not pick up a win or a save.